Plastic Grinding Milling Granulator adopts Japanese design principles, employs the principles of grinding rapidly, agitating continuously, milling and fractioning to be heated with multi-knives and cooling and contracting. It produces granules from waste materials and angle materials such as the plastic films, filament, ribbons, pieces, soft plastic pipes, foaming materials, and degrading materials, and puts then into reproduction .It is the latest ideal granulating equipment to recycle plastics and reproduce. 1.Recycle the waste materials and leftover bits and pieces of various flexible plastic films, bags, filament, ribbons, pieces, and pipes such as polyvinyl chloride, polyethylene of higher density, and linear polyethylene of lower density, and put them into reproduction. 2. Recycle and reproduce the grinding and granulating of degrading plastic films and angle materials. 3.Grind chemical fiber waste materials, and process the waste filament that has been put into reproductions. 4.The machine is applied in many respects. 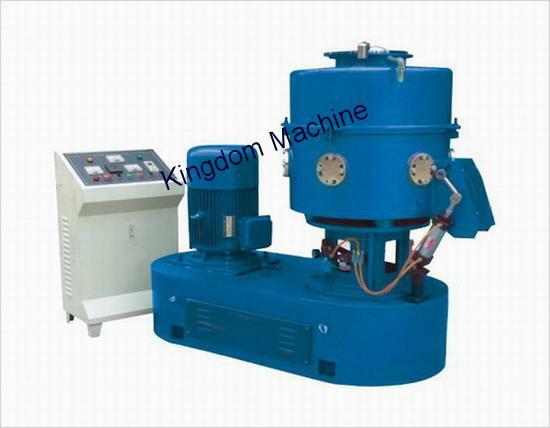 It can be substitute for blending machine or dryer. D: The interstitial of the blade can be adjusted with convenience of replacing. E: It is characterized by high efficient in production and low consumption(1 ton of daily production ,and 200 degrees of electricity consumption ). F: Granulate at lower temperature, do not damage molecular structure of materials basically, and do not damage physical performance.